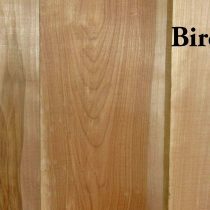 We carry unselect Birch, a mix of both white and red birch. American birch also called white birch, is grown in Canada and the USA. It is straight grained creamy white wood with an even texture. It is often used for furniture, domestic wares, toys and baskets. Birch takes dye and stains well. This species typically runs narrower than some of our other species with average widths between 3-1/2″ and 5″ wide. S4S means this hardwood has been surfaced on all four sides. This board has a cleaner appearance than S2S1E. Available in 4/4, 5/4, or 8/4 thickness, 1-1/2″ to 5-1/2″ wide, and 3′ to 8′ long.